The latest on technology policy from AEI, published daily. What’s new in tech policy at AEI? Despite the recent drop in Silicon Valley stock prices, there is some good news beneath the surface of technology finance. In their most recent update, PitchBook and the National Venture Capital Association showed that US venture investments for the third quarter totaled nearly $28 billion. For the year, it looks like venture investments will top $100 billion, exceeding the previous record by more than $20 billion. Early stage investments have grown over the last two years, from a level of around $5 billion per quarter to a level closer to $9 billion per quarter. 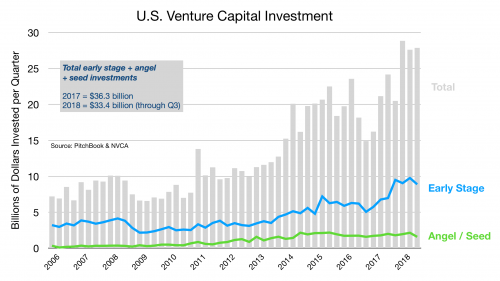 Investments in even younger companies — known as angel and seed rounds — meanwhile, have been fairly steady for the last four years, hovering around $2 billion per quarter. This raises a question about the overall structure and dynamism of the economy. We know that over the past several decades, the pace of new business formation has dropped. The ratio of entries versus exits has fallen. The Atlantic even says that “Startups Aren’t Cool Anymore.” Many have claimed that the chief reason for the supposed rising concentration of industries is a lack of robust antitrust enforcement. No industry has come under heavier fire than Big Tech. Lax antitrust is a convenient villain but far too simplistic for our taste. What if the chief problem isn’t Washington’s antipathy but instead its overzealousness? For example, the cost of going or staying public has risen dramatically over the last two decades. Initial public offerings (IPOs) plummeted after the Sarbanes-Oxley regulations were enacted. Mergers and acquisitions soared. Big Tech buyouts became the chief exit strategy for venture-backed firms. But regulatory factors drove consolidation in other industries, as well. For example, the Affordable Care Act dramatically accelerated consolidation in health care, where giant health systems gobbled up hospitals, clinics, and physician practices, first around their states, then their regions, and now nationwide. As a result, the number of publicly traded US firms dropped from nearly 8,000 in 1996 to fewer than 4,000 today. This consolidation is not only the result of regulatory overreach. Other structural factors are probably also at play. 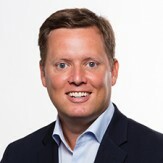 For example, many people thought the plummeting cost of information driven by the internet would boost the number of smaller, independent firms. That’s true in some cases. But it’s also had just the reverse effect for some firms in some industries, where Coasean transaction costs dropped even more inside of firms. So companies like Google, Amazon, and Apple could absorb hundreds of software-based firms and grow into trillion dollar titans. Yet the regulatory rationalization of the last two years is healthy, and is sparking the economy in a number of ways. One is the robust growth of venture capital, to record levels. Another is an upturn in IPOs, where activity has been the healthiest since 2014. It will take years to determine whether new policies can substantially alter the structure of the economy, whether we can truly boost entrepreneurial dynamism, or whether slower rates of business entry-exit are here to stay under a new normal of big company capitalism. It would be a mistake, however, to launch an antitrust crusade to correct a perceived problem that may actually be the result of overbearing policies that policymakers are already well into the process of fixing.